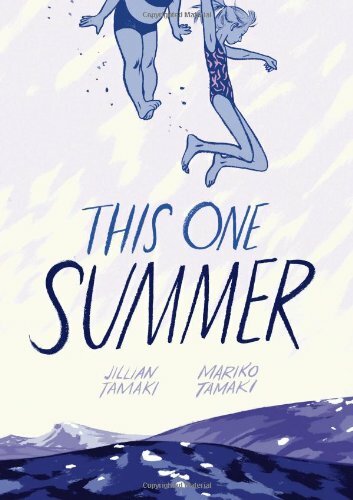 This One Summer is the second graphic novel by the same team behind the critically acclaimed Skim — cousins Mariko (author) and Jillian Tamaki (illustrator). The book is published by First Second books, which also brought us Alan’s War and Gus, two of my favourite graphic novels. Jillian Tamaki delivers yet another masterful graphic novel with her art and Mariko captures the story well with her keen observations of teenage life. The story is told from a first person account as the protagonist Rose spends another annual summer with her family at Awago beach. But this summer is different. Tension is in the air and an incident is brewing in the background. The friendship between Rose and Windy feels vivid as the two girls spend their time engaging in their own little adventures. Mariko creates the tension between Rose and her mother very well. The tension is always there, simmering at the surface. The reader is left wondering why Rose’s mother is struggling with her emotions and not in the mood for summer until all is revealed at the end. Jillian Tamaki’s fluid brushwork and lines never fail to amaze; she understands the medium of comics very well. I particularly like the way she uses multiple small panels, each with a careful composition to visually show how time has moved or when she presents snippets of keenly observed scenes before cutting to a scene of the two teenagers being bored.The spread illustrations are gorgeous to look at too. The artworks are printed monochromatic with blue on white pages instead of the usual black, which enhances the fluid brushwork, her signature style. This One Summer is another superb graphic novel by them and I cannot wait for Jillian Tamaki to have her SuperMutant Magic Academy anthology published in 2015 by Drawn and Quarterly.